Citroën UK celebrates its sponsorship of Channel 4’s First Dates with a series of idents featuring Citroën’s very own French personality gives lessons in love and dating. “Always dress to impress! Just nothing too showy”, the French man says from the backseat of the new Citroën C3 Aircross SUV, revealing as he gets out of the car, a cowboys suit, completed with a cowboy hat. 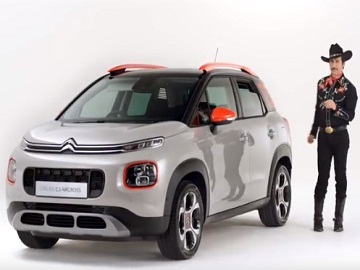 “Find low with Citroen and First Dates on 4,” the voiceover says at the end of the advert, which is only one of a batch directed by Sam Washington. Citroën UK signed a two year partnership deal with British television broadcaster Channel 4, which sees the automotive company sponsor the popular TV dating show First Dates, in December 2017. In addition to the sponsorship, Citroën and Channel 4 have been collaborating on the launch of an original content series for All 4, which will also be distributed across Citroën’s own channels. Citroën revealed the European version of New C5 Aircross, its new flagship SUV, earlier this year, at the end of May. The brand’s new flagship SUV boasts “a unique and assertive personality and an all-new customisation offering with 30 exterior combinations”. An ambassador of the Citroën Advanced Comfort programme, the new C5 Aircross SUV is described as “the most modular and the most comfortable model of its segment”. Among its key features are the suspension from Progressive Hydraulic Cushions and Advanced Comfort seats, three individual sliding, folding and inclining rear seats, best-in-class boot capacity of 580 l to 720 l, 20 driver assistance systems including Highway Driver Assist, a level-two autonomous driving system, and Grip Control with Hill Descent Assist, six connectivity technologies, including wireless smartphone charging. Produced in France at the Rennes-La Janais site, the new Citroën C5 Aircross is set to launched in Europe and the rest of the world starting in late 2018 and will be the first Citroën vehicle to come in a plug-in hybrid version at the end of 2019.